I did love to fly around Nagrand in World of Warcraft’s first expansion, Burning Crusade. And still, when I’m levelling a new alt, I’ll often take them there. And it was nice to hang around in the Outlands, on occasion, and not feel like I was watching the end of days. With Warlords of Draenor, we get to go back to Nagrand, back when it was home to the Warsong clan, led by Grommash Hellscream. Quite a bit of history there. Senior game designer Eric Maloof and associate game designer Kurt Sparkuhl have spilled the beans on the old new zone in a preview of the area, and it’s looking lovely. The zone will boast a lot of character focused stories, too. Sparkuhl says that there’s a main quest involving the Throne of Elementals, and lots of Easter eggs, cameos and backstory for players to uncover. And there’s the Warsong clan, which patrol the zone with wolf riders and guard it with fortresses. Two different building choices will be available when you make your Nagrand outpost. They are the corral and tankworks. Constructing the corral gives access to the stalwart talbuks if you’re Alliance, or a vicious frostwolf if you’re horde. They are mounts for riding around on in Nagrand, and Maloof says that this is where the mounted combat will come into play. I reckon the tankworks are more my speed though. Erect this building and you’ll net yourself a siege engine or a demolisher, for Alliance or Horde respectively. Oh, yes. 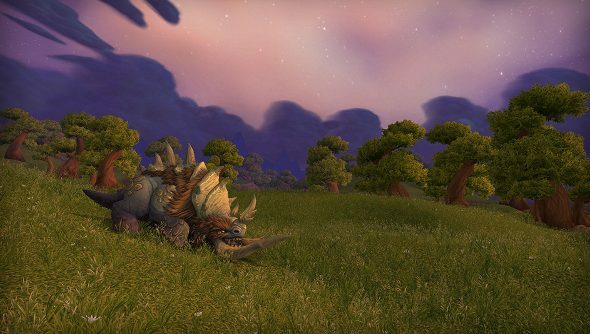 Think you’ll be taking a wander around Nagrand when the expansion drops later this year?